Deep Conditioning Tips for Long Natural Hair- Cool and Seal! Several years ago, my youngest sister gave me a couple little deep conditioning tips. You see, I had been ogling the Ouidad Deep Treatment, because I had been reading so many rave reviews about it. However, the joker was $50 for 8 ounces (8.5 now)! I just couldn’t see myself spending that much for a conditioner. $18 for 8 ounces of Carol’s Daughter Tui Hair Smoothie was already hurting my wallet! So, my sister says to me one day, “I don’t think it’s the conditioner per se, I think it might be the technique.” She tells me to allow my DC to cool for 15 minutes after I remove the heat source and then, put my regular daily conditioner over the DC before rinsing them both. Well, I tried this shortly thereafter and it really seemed to make a difference in how my hair felt after rinsing the DC! You know how your hair will feel great with conditioner in it? But some conditioners, once rinsed, don’t seem to leave any of the benefits you felt while they were in your hair? Well, after rinsing using this technique with the Carol’s Daughter Tui Smoothie and some Pantene (I think) my hair felt smoother, more supple and as if the moisture from the DC was better retained. 1. Completely saturate clean, damp hair with 2 oz. of treatment on shoulder length hair – a bit more on longer hair. 2. Cover with a shower cap and heat with blow dryer. Allow warm product to remain for 12 minutes. 3. 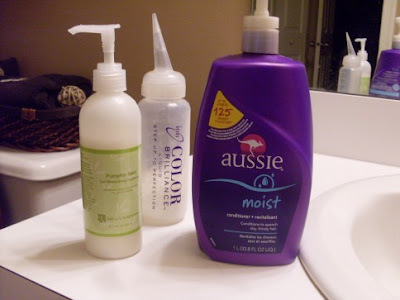 Before rinsing out, add a conditioner to hair. Then rinse both products; allow a little coating to remain. Under the Deep Treatment section of the Styling Guide, it indicates, ”Before rinsing, add a daily conditioner to seal in the treatment” (emphasis added). My guess is that allowing the DC to cool is recommended based upon the same principle as using cool water to rinse conditioner. As heat will raise the cuticle layer, allowing the hair to cool after removing the heat source facilitates the relaxing/closing of that layer. Then, applying a daily conditioner over the DC somehow helps to further seal the moisturizing agents of the DC into the hair strand like using an oil or butter to seal a water-based moisturizer! That’s just my conjecture. Apply approximately 2 ounces of DC of choice (currently, Darcy’s Botanical Pumpkin Seed Conditioner or Shea Moisture Raw Shea Moisture Retention Deep Treatment Masque) to wet, but not dripping, hair (or 0.5 ounces per section). I ensure the section is thoroughly covered with DC and then twist it until I have four DC covered twists. Gather four twists together and use rounded-tooth jaw clip to secure ends near top of head and don plastic cap. Apply heat for a minimum of one hour (usually a Winter hat). Remove heat source and allow hair to cool for a minimum of 15 minutes. In shower or sink, pour entire bottle of diluted conditioner over twists, fully saturating them. I believe that one of the major reason that my hair retains length and stays well-moisturized throughout the week is due to a consistent DC regimen. Though I know there is controversy out there related to deep conditioning and deep conditioning with heat, I’ve always noticed improved hair health and length retention when I deep condition at least once a month. I have achieved the longest hair I’ve ever had in my life since I began DC’ing every time I wash, which is typically once a week. Do you “cool and seal?” If so, have you noticed a difference in your hair using these techniques? If you’ve never tried these tricks, would you? Are you having great results with your current DC regimen? Inquiring minds want to know!! Before today I had never heard of the "cool & seal" technique. I am so excited to try this when I DC this weekend! *high five* and huzzah! I read an article recently that recommended allowing the DC to cool after sitting under a warm dryer and prior to rinsing. I then did a rinse with my daily conditioner and WOWZA! It really does work. I plan to do this weekly. I'll try it this weekend. Thanks for the tip! Thanks! This makes sense to me. Can't wait to see my results when I DC this weekend! I did it last night Shelli and my hair actually feels thicker and the breakage has stopped. I used As I Am Naturally Intensive conditioner (no protein) on the length of my hair and Ultra Black Hair protein conditioner on my ends. I sat under the dryer for 30 mins, cooled for 15 and then poured Hello Hydration (diluted) over my hair. I did however rinse warm and then final rinse as cold as I could take it. Next time I'm going to do it in the sink instead of shower so I could go right to the rinse. However, so far so good! I hope this works beacuse I deep condition often, but right after I rinse my conditioner my hair feels like I havent done anythign to it-- and it begs for more mositure! Thanks for the tip, will definitely try it! I would have never known about this! Thanks for this post! I use the Ouidad Deep Treatment and use this method! I feel it really does work really well! Looking forward to trying this over the weekend. I am new on this site which I love. I have been transitioning since August 2010. My hair looks like 3a/3b, with 3c at the crown. Using the hooded hair drier has totally changed my experience I have to say. My hair often ends up frizzy when I let it hair dry even with leave-in conditioner, but when using the hooded drier (let it air dry for 30 min, then use the hooded drier to complete the drying), my hair ends up very smooth and soft. I used a ionic hooded drier. Thank you! I am so going to try this. I've only been curly for a few months and I am still having problems with my technique. Even the most raved about products won't work if you apply them incorrectly. I used the Shea Moisture Deep Treatment Masque and I felt like once I rinsed it out it was like I didn't do it. BTW any suggestions or special techniques for making my braid-outs last for more then a day. Do I put Oil or gel first?? I def need to do a deep conditioning. I deep condition twice a week using UBH conditioner, but I will definitely try adding the instant conditioner at the end. To make your braid-outs last longer, use a water based conditioner, seal with a butter or oil (I use shea butter) and then add the gel. This is what has worked for me.....I use flax seed gel by the way. I use a great hair product that leaves my hair healthy, shiny and resilient, it's Pro Naturals Moroccan Oil hair treatment with heat protector smoothes the cuticles and helps fortify hair that is prone to breaking and split ends. Provides heat protection against electronic hair tools, prevent further damage. I have never tried this regimen but I can see/understand why this would work. I am going to try this this weekend since it is time for a wash and DC. I just followed your regiman and my hair feels so soft. Thanks Sherri for sharing your regiman. Thank you all for your comments! I'm so happy that you found this helpful and super excited that those who've tried it have noticed a positive difference!! Ashley, have you ever tried the technique with a conditioner other than Ouidad? I'm just wondering if you'll notice a difference or if it works just as well with another product for you. I actually finally bought the Ouidad DC on sale a couple of years ago. I didn't like it!!!! I used it one time and it's been under the sink ever since! I think it might be the protein. My hair is finicky about proteins. I thought it was entirely protein-senstive, but I've come to realize that it seems okay with certain proteins and not with others. I have to start figuring out which ones don't cause a problem and which ones do. Anywho, though it was on sale, it was still really expensive. So, I've kept it because I plan on one day using it mixed with honey and oils! That seems to help many DCs!! LOL!! Thanks again all and I'd love to know how this technique works out for you either here or on hairscapades.com. Thank you! I tried this yesterday and this method is definitely a keeper. I am tickled for two additional reasons too. First, I am using up a conditioner that I was not happy with as a LI to rinse out the DC. Second, I found that I could de-tangle after my hair 'cooled' and before I got into the shower.The session was great. There was barely any hair in my comb AND I feel like I use less water in the shower that way. I love it when I can find a way to be more efficient. Thank you so much for sharing the method. Thank you so much for the feedback Anon! That's awesome:)!! I tried this method this weekend. I shampooed with Shea Moisture moisture retention. I then applied Jessicurl WDT to section hair and applied Qhemet biologics cast/moringa oil to the ends then detangled and twisted. Saran wrapped and donned a scarf and ran some errands. After letting cool I rubbed Aussie Moist condish on each section/twist and rinsed with cool water. Results...A...MA...ZING! Thanks for the tip u totally revived my hair. I would like to try this method it sounds great but I was wondering, has anyone tried it who puts their DC in before they wash their hair? Would I be just countering the effects if I did it this way? Hi Anon @ 3:09. I've never done the DCing before washing, so I'm not certain how/if this would work if you wash afterwards. Do you shampoo or co-wash to detangle? Hey, what the heck?! It can't hurt to try it!! Why don't you give it a whirl and let us know if you notice a difference when doing the DC and technque pre-wash? I'm sure others would be interested! Thank you! And Momo, YEA!!!!! Seriously, I get excited every time that I read that this worked for someone else!! I've been dealing with heat-related breakage, so these deep conditioning tips are much appreciated! Aww man! I'm putting yarn braids in! Hopefully I'll remember to try this when my hair is loose again in 5-6 weeks! I really like this conditioning trick. Whenever I would rinse the DC out of my hair,it would do more harm than actual good, breaking off a little at a time. Or when I would try to detangle using the DC, let's just say that was a fail. But now using this treatment, my hair is a lot softer after I finish washing, and to top it off, my hair is easy to detangle too! The cool and seal method really works for me. Also, a great thing to do prior to this cool and seal method is to hot oil treat your hair, then shampoo w/ a mild shampoo and then do the cool and seal DC method. Honestly, even with my mini twists in my hair, I can tell the difference. Thank you sooo much! Hi FrankieFree! Thank you so much for giving the feedback on your results with this method! And, I'm so happy to learn that it worked well for you!! Yeah!!! That is always the most rewarding thing, to learn that something I shared helped someone:)!! Thank you!! I tried this today and I love the results! My TWA-ish kinks were soft and easier to detangle. This was my first DC since my big chop. I used an avocado/olive oil conditioner, and rinsed with an HEHH conditioner/cold bottled water mixture. Thanks for the tip!! That is awesome Kink'd! So glad that it worked for you too!! I have a few, questions: is there a reason behind not rinsing hair upside? Also how long do you wait after pouring on the daily conditioner before rinsing hair? The reason I don't rinse my hair upside down is that it can lead to tangles as the hair is being rinse up and then has to brought back down. In regard to the daily conditioner, I apply it over the DC and then rinse immediately. No wait time at all. Hope that helps!